Verizon's first-quarter iPhone sales fell by a third over the fourth quarter. Either iPhone customers are growing savvier, or they're starting to tire of Apple's smartphone. Verizon's iPhone activations fell 33% in the first quarter, compared to the fourth quarter. Though the first quarter can serve as a tough comparison to the prior three months -- the stretch each year during which Apple typically releases its new smartphones -- the drop is considerably steeper this time than it was last year. Last year, Verizon's first-quarter iPhone activations fell by 24% from the fourth quarter. The nation's largest wireless carrier said it activated 4 million iPhones over the past three months, 2 million fewer than the 6 million it sold between September and December 2012. Verizon (VZ) said just over half (55%) of the 7.2 million smartphones it activated last quarter were iPhones. That's down from 64% in the previous quarter. That doesn't spell doom for the iPhone -- year-over-year, Verizon's iPhone activations grew by 25%. But there is cause for Apple (AAPL) to be concerned. 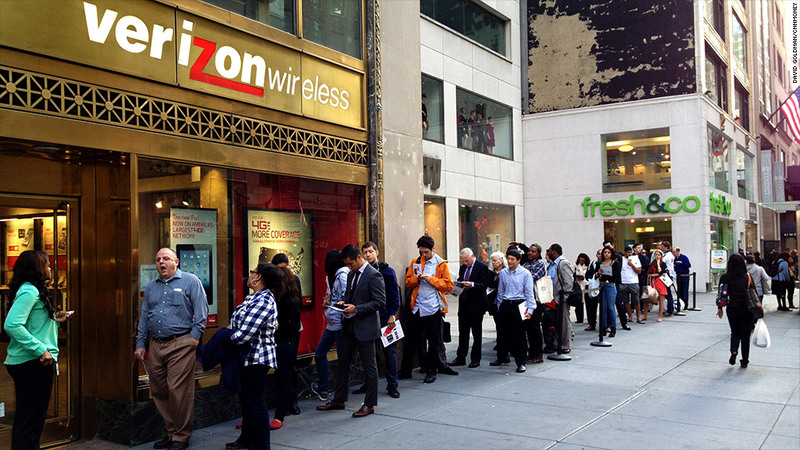 Just half of Verizon customers who bought iPhones during the first quarter bought the latest model, the iPhone 5. The steep $100 and $200 discounts on Apple's older devices, the iPhone 4S and iPhone 4, are the likely culprit. Though each new version has brought some helpful tweaks -- including faster processors, larger screens and the Siri voice-controlled assistant -- the iPhone 5 isn't dramatically different from the iPhone 4, which was released in 2010. Apple, which will report its quarterly results on April 23, has disappointed Wall Street investors lately with lower-than-expected iPhone sales -- even as it sold a record 48 million of the devices in the fourth quarter. In the market-share battle, Apple still trails smartphones running Google's Android smartphone operating system by a wide margin. It's also possible that customers are becoming smarter about when to buy the iPhone. Apple has consistently released its new smartphone in the late summer or early fall, and consumers seem to be catching onto that trend. IPhones are now setting records in the fourth quarter, then taking an increasingly steep quarter-over-quarter dive in the first three months of the new year, when other device makers begin to show off their new toys. The beneficiary of this trend appears to be the wireless carriers. Carriers pay more money upfront to Apple to subsidize the iPhone than they pay other smartphone makers for rival devices. Verizon reported a 50.4% wireless profit margin in the first quarter, up sharply from its recent low of 41.4% margin in the fourth quarter. When it sells fewer iPhones, Verizon performs better -- in the near-term, anyway. That's been the trend for Sprint (S) and AT&T (T) as well. Both of Verizon's prime rivals will report their quarterly finances next week. T-Mobile also began selling the iPhone for the first time this month.